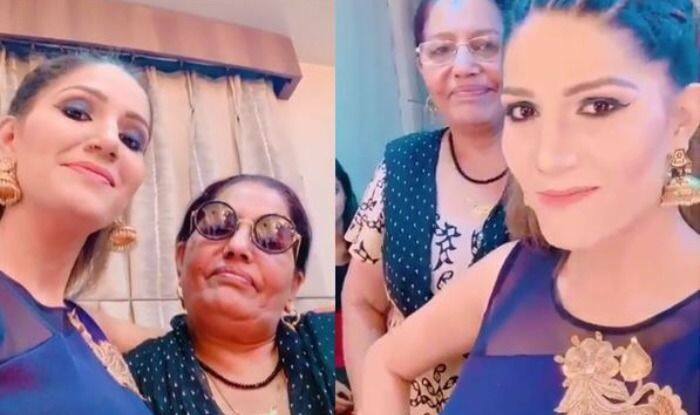 Sapna Choudhary's hot dance with mother on 'Baby Marva Ke Maanegi' song is breaking the internet, Watch their expressions. Haryanvi hot dancer Sapna Choudhary is a family oriented woman. She loves her family and spends time with them even if she is busy with stage shows and other work. Recently, the Tik Tok lover made a dance video with her mother. They can be seen grooving to Raftaar’s ‘Baby Marva Ke Maanegi’ song. In a blue body-hugging dress with golden jhumki, Sapna is seen entertaining her followers on Baby Marwa Ke Manegi. On the other hand, her mom’s expressions are on fire. The Anarkali of Haryana also danced on one of the best South Indian songs. She can be seen doing freestyle and flaunting latkes-jhatkes. Sapna is a born entertainer who barely misses an opportunity of making her fans go gaga with her videos. Her mother will be seen doing a Haryanvi project with her titled ‘Chachi Ram Ram’. In November 2018, Sapna shared the posters of Chachi Ram Ram. The comedy-drama will star Neelam Attri, Shikha Raghav, Karan Mirza, Jaggs Minor, Joginder Kundu and Soni Attri. Bankrolled by Jyoti Mishra, the comedy web series Chachi Ram Ram is written by Aamin Barodi. Sapna Choudhary is coming along with Daler Mehendi in a Haryanvi song ‘Bawli Tared’. The song is sung by Daler Mehndi and Sapna Choudhary themselves and is penned by Daler Mehndi and Krishna Bhardwaj.